Car leasing is a fantastic alternative to long term car rental in Geneva. The insurance included is certainly a highlight, covering many European countries! Leasing is a tax free buy back programme endorsed by the French government to encourage tourism. There are only 3 companies you can lease from in Geneva and these are; Renault, Peugeot and Citroen. The variety of vehicles offered by these three companies are extensive and selection of the best deal can be an overwhelming experience. Udrive takes the hassle from our customers and compare the rates from these three companies to suit your needs. We will simply compare and provide you with the best possible quote from one of these companies within 24 hours of receiving your quote request. We're confident that once you've compared our prices to those elsewhere, you'll find that our deals are unbeatable. Specifically designed for non-European residents and travellers planning an extended holiday in Geneva between 17 and 175 days, all vehicles are left-hand drive. It is a great alternative to car hire allowing you to explore the best of Geneva as soon as you arrive. Please note that most vehicles include insurance with no vehicle excess, full factory warranty, personal accident insurance, free additional drivers, unlimited kilometres and 24 hour roadside assistance in 8 countries throughout Geneva. Geneva is the second largest city of Switzerland and also a major player on the international stage of commerce. It is most noted for being the headquarters of the UN and also the location of where the international Geneva treaties were signed. There are many attractions that are waiting to be explored. Eight two buildings and sites are protected under heritage law and most of them are open to the public. One of the most well-known landmarks of Geneva is the Jet d’Eau, also known as the Rade and holding the record as the world’s tallest jet of water. It is a water fountain reaching 140 metres up into the air. See it from a distance but no doubt, the landmark is more spectacular when viewed up close. Just be prepared to get wet! If you are able to complete the steep walk up hill, the streets of the old town often throw up unexpected surprises. This urban area is historically rich for architecture and small boutique shops. Road side cafes prove popular as does the major attraction of the Barbier-Mueller Museum. Nearby is a magnificent building called the Cathédrale St-Pierre. Belonging to the Swiss reformed church, the blend of architectural style from over the years has produced a unique and magnificent landmark. The view from the top of the towers is an awe-inspiring panoramic horizon and church services are also regularly held for anyone that wants to attend. To the east of the city, lies Geneva lake and it makes a great family day out. Lunch is available from one of the many lakeside restaurants and small cruises are a relaxing way to view the landscape. Ideally allocate one or two nights to stay in the region. Yearly, there are many events and festivals held here and daily excursions such as cycling and mountain biking are sold. There are over 30 museums dotted around the city although the most popular is the Red Cross museum. They make use of photography to show humanitarian disasters from all over the world throughout history. Although it is a serious topic, it is a very enlightening and educational visit. Anyone who does not have to stick to a budget will enjoy shopping on the Rue de Rive. If money is restricted, it is still worth wandering down the street to gain a sneaky insight into life of the rich. If you are there in June, time your visit around the Fête de la Musique, a three day event showcasing music, dance, food and drink. The whole city participates in this event so pre-book accommodation if you plan to attend. 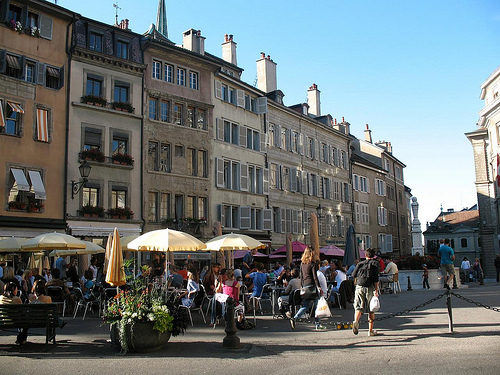 Creative and artistic like-minded people will enjoy wandering around Carouge that is filled with artists seeking out inspirational sources. During the day, many cafes are open and at night time, jazz clubs open their doors to large crowds. We have recently returned our Euro Pass, Citroen DS Chic after some 68 days through France Spain and Portugal. It is the second time we have used UDrive to arrange our Euro Pass and once again it went extremely well, no fuss pick up and no fuss drop off. Very happy once again for the experience and would have no problem using or recommending you again and again. “We travel every year to Europe and have always just rented a car from the mainstream rental companies. For the life of me, I cannot understand how we have not known about this short term leasing system run by the French as it is surely the best way to go. Everything is super easy and when I compare all the previous rental transactions, this beats them hands down. Although the system only works in selected counties and from selected airports, the process works like a park and ride service from the airport. You are picked up upon arrival and shuttled to the business location, which is generally a very short ride from the airport. The paperwork is minimal and only after a couple of signatures, your brand new vehicle is handed over to you. This took about 10 minutes. The vehicle is registered in your name and you get full comprehensive insurance with roadside assistance if required and best of all any one of your family can drive without being slugged for the additional driver cost. The drop-off process is similar and very trouble free. It was quite strange dropping off a brand new car with only a few thousand kilometres on the clock. This whole process is of course only possible through the excellent service provided by Udrive and specifically Michael Alton. The documentation is prepared very well in advance to ensure that it all happens smoothly upon your arrival. I always wondered what the red French registration plates meant and these are transit plates provided mainly for the purpose of this leasing system. It is therefore easy to recognise these cars travelling throughout Europe. This was the second time we leased a car through udrive. Again the booking, collection and drop-off were very efficient and all the staff were very helpful and friendly. We hope to travel to France again in a couple of years and will have no hesitation in using udrive again. I have also recommended udrive to seveal friends because the service and prices are excellent.